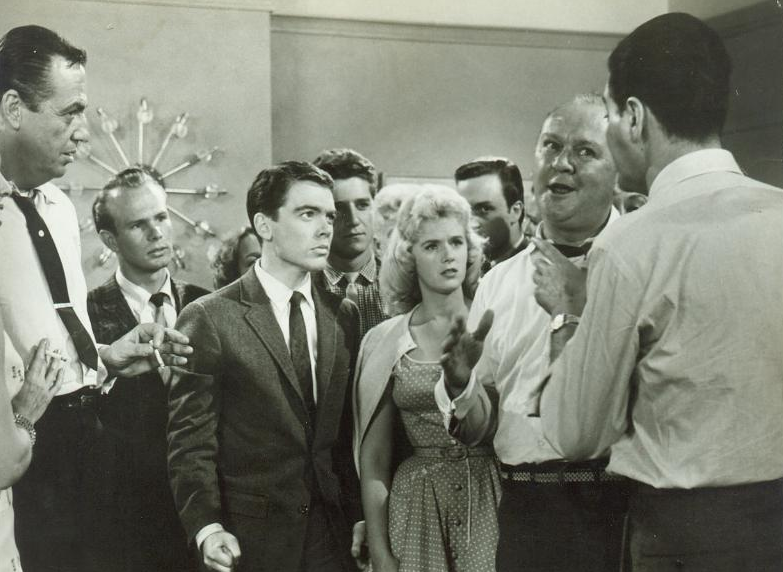 Barbara Nickerson (Connie Stevens) is a girl who typically hangs with the squares – until the night that Twig (Mark Damon) and his gang crash one of her friends’ parties. Twig is a tough guy with a bad reputation, and Barbara decides to start hanging out with him and his buddies, dragging her boyfriend Josh (Bobby Driscoll) along with her. Though she comes from what seems to be the most “normal” of the group’s families, Barbara seems to be a bit of a bad apple, pushing herself and the boy she’s supposed to care about deep into trouble. Inevitably, Barbara, Josh and their new buddies find conflict when they crash the wrong kind of party. And meanwhile, the parents of this rambunctious trio (Cathy Lewis and Onslow Stevens for Barbara; Doris Dowling and Walter Brook for Twig; Frances Farmer and Denver Pyle for Josh) prove that they aren’t so sweet either. 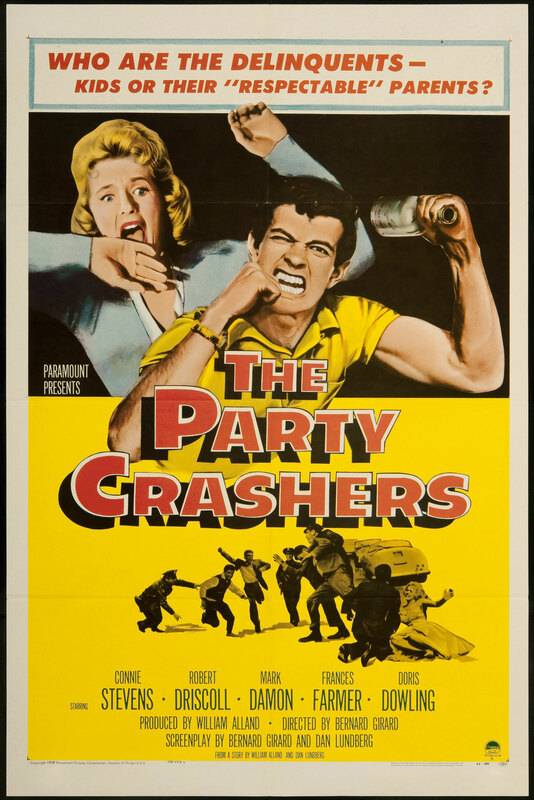 Bernard Girard directs 1958’s The Party Crashers, which he wrote the screenplay for along with Dan Lundberg. The film is notable because it features the final big screen roles of both Frances Farmer and Bobby Driscoll, two of old Hollywood’s most troubled and tragic stars. The Party Crashers starts out in the land of the dull, picks up in intervals but eventually lands back in snoozeville again. It gets a little bit crazy in the final third and becomes much more gripping than before, only to take a huge slide backward. It sometimes tries very hard to be emotional and dramatic, but usually to no avail. The approach of focusing on both the teens and their parents during a decade filled with teen-centric films is interesting and shows that both groups are less than perfect, but it leads the film to purport that the kids’ attitudes are based solely on their home lives, which is problematic. The one aspect of the story that does have some emotional impact is that of Twig’s home life. His dad is a drunk, and his mother spends most of her time away from the home. When she is around, she’s always battling with her husband. This situation leads the viewer to empathize with Twig, making him the only character that we ever really give two cents about. Doris Dowling is absolutely fantastic in her role as Twig’s mother. Her screen time isn’t huge, but she completely steals the show during her scenes. She’s full of anger, sass and genuine emotion. She and her on-screen son carry the film. I didn’t realize Frances Farmer was acting as late as 1958. It’s too bad there are a “plethora of dull scenes” as you put it. I believe this was the only film she did that late in her career. If I remember correctly, she’d been doing a bit of TV and hadn’t made a film for nearly 20 years when this was shot. The studio wanted to give her a “comeback,” but obviously that plan didn’t work out for them. Her performance is interesting to watch, but the film as a whole just misses the mark.